Cushion Foundation is quite a makeup rage these days. Everyone is talking about them and brands coming with their own line of this product. And why not, given the product handiness and ease of application, it is a well-deserved talk of the town. I was not too kicked about them when I heard about them recently. I had an experience with them during my school time. Yes, my school time, wherein like a lot of teenagers, I have rightfully claimed the product from my mom' makeup stash and try on self without knowing the congruency between shade type and skin tone. I am unsure if the brand was Estee or cover girl? I do not recall but yeah it was quite square in the shape. Very moist. Probably I did not use it right at that time or may be the shade wasn't my type. But hell yeah! If you are a teen and you try your mom's makeup with limited skill sets, it is all set to go wrong. Right? I told myself- "Ah well cushion foundation did not work for me." "we have got a point," said my inner self and pat myself on back. I gathered myself from the confusion and I was like ok..let's try it. 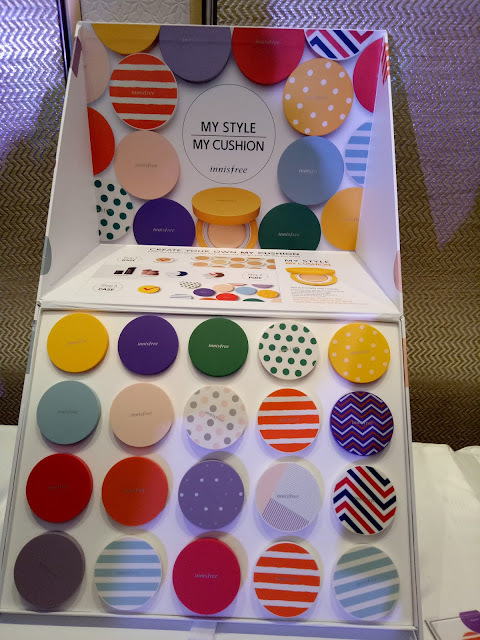 So when I attended Innisfree Namrata Soni makeup master class, little did I realize that cushion foundation will become one of my makeup go to products. Quite literally. Moving from my quite a long prologue, let me tell you a little more about this cute little product that I have been using for quite a while and have even shot a video on the same. You can watch this video here. It is a newly launched [in India] Cusion Foundtaion from Innisfree. Before you ask me, let me tell what is a Cushion foundation is. A cushion Foundation or CF is a liquid pre-makeup formula that is housed in a compact and comes with a sponge applicator. It is essentially a round sponge soaked/filled with liquid foundation and can be used as touch up. After BB and CC creams, it is another charming makeup trend borrowed from South Korea. The product aims to provide sheer coverage along with some skincare benefits like sunscreen and dewy finish. They come in easy to travel with cushion cases. Interestingly you can make your own cushion foundation. 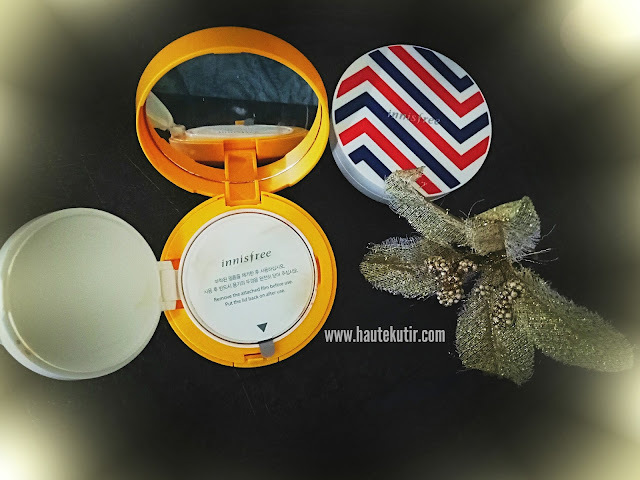 While there are several brands from Etude house to Maybelline that have their own line of Cushion Foundations, we shall explore more on the one provided by one of my favorite brand- Innisfree. Staying power is decent and a well-applied CF on a clean face can stay up to 5-6 hours easily. Good new is that it comes in 6 different shades for 2 different skin types- oily and dry skins. I have a wheatish to fair skin complexion with combination kind of the skin. Since my skin is more on the dry part, I have selected an appropriate shade from the water glow range. It is sheer and has a natural dewy finish, wherein the Coverage is medium and it has a dewy finish but it often tends to get a little oily unless you pack it well with a good compact. I have tried one from etude house and somehow find this better. How To use: Select your applicator. 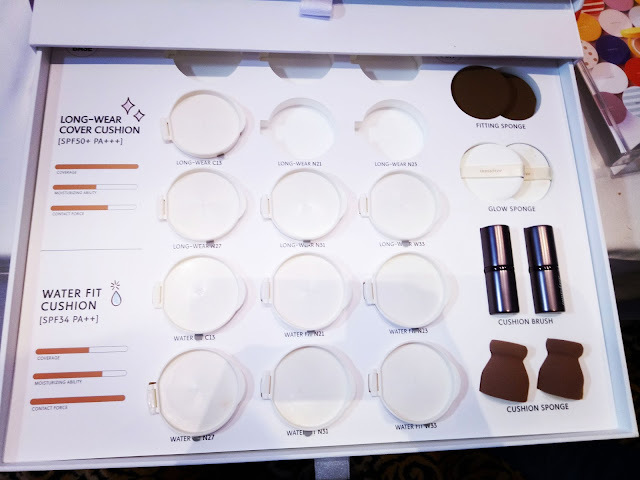 It comes with an option of four different application tools ranging from a soft sponge to beauty blender to a foundation brush. 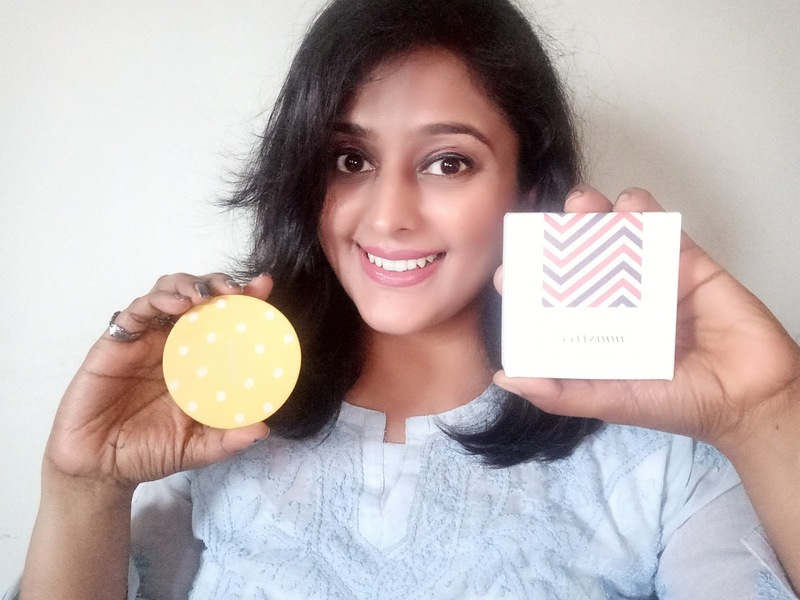 Haute Kutir Verdict: I am not a BB cream person and foundations gives me a very heavy feel. 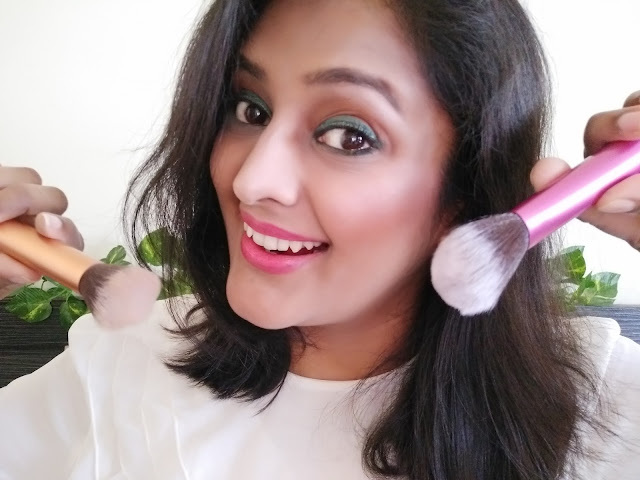 Cushion foundation comes as a boon to me. This one has a good puff applicator but the coverage is very average. In spite, I like the product for its handiness and ease of usage. It is very light on the skin and good for casual wear. The price like I said is on a higher side and if worked upon, will make this product quite sought after vis a vie the ones in the same segment. 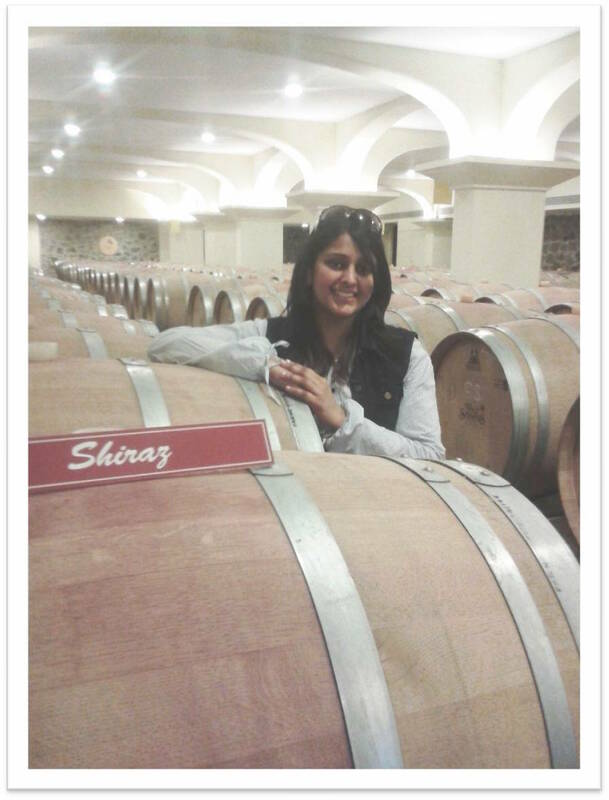 Let me know if you have tried one and if yes, do share your experience.